Kevin Durant in game action on Oct. 26. Photo courtesy Brad Penner/USA Today. As someone who lives and breathes sports, I can tell you that October is the most interesting and jammed-packed month for sports. Baseball is winding down, the NFL is in full-swing and the long-awaited NBA season is just getting underway. This NBA season brings about new faces in new places, with a big boom in the free agency market and blockbuster trades in the offseason while ushering in a talented rookie class looking to ignite the league. However, fans of the NBA like myself feel disappointed with the current state of the league. Teams are either stacked to the brim with talent or have a lifeless group of players that struggle night in and night out. Building a superteam is the new norm around the league. Jacob Dairaghi, a first-year biomedical engineering major, said he believes the league has become predictable. Dairaghi’s point doesn’t come without evidence. For last four years, the Finals have been a stale matchup between the Golden State Warriors and the Cleveland Cavaliers, resulting in Golden State taking three out of four of the series they played. The matchup became even more lopsided when, during the 2016 offseason, the Warriors made a big splash in free agency. Enter Kevin Durant, a generational talent who has continually dominated the league. 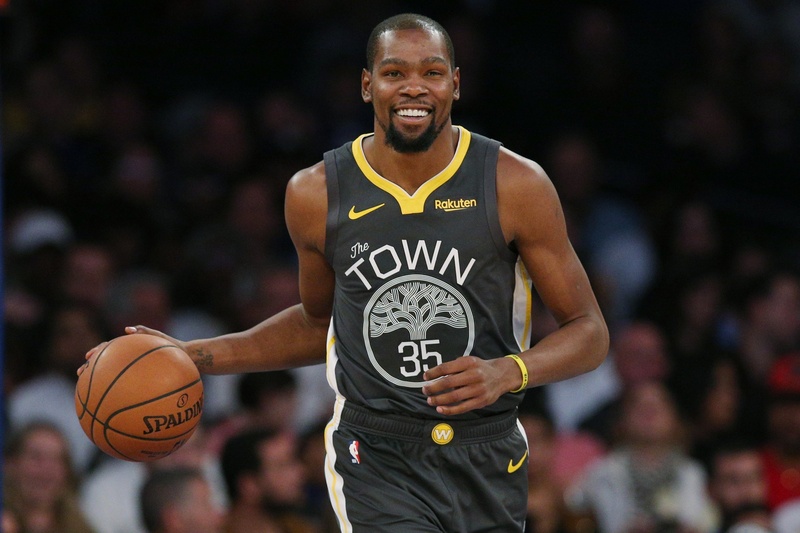 Accolades come in abundance for Durant, who — up until 2016 — has been a part of the All-NBA team six out of the last seven seasons as well as the league MVP in 2014. One goal, however, continued to elude Durant for years — a ring. If you want to be regarded as one the greats, it’s essential to win a championship. Durant took his team, the Oklahoma City Thunder, to the Finals in 2012, but ultimately fell to the Miami Heat four to one in the series. Miami was one of the earliest stacked teams — its roster was filled with talents such as newly acquired LeBron James and Chris Bosh, as well as fan favorite Dwyane Wade. Although the dream team went on a Finals tear for four straight years, Miami won only two out of the four series, showing they could be beaten. After a few seasons of Durant’s team being mediocre, his squad finally made a push for the championship. In 2016, Durant, alongside fellow star Russell Westbrook, made it to the Western Conference Finals against the reigning league champions Golden State Warriors. The Thunder looked to dethrone the champs and took an astounding 3-1 lead in the series and looked as if they had their ticket punched to the championship. Tragically, though, as if the team forgot they still had one more game to win, the Thunder suffered an embarrassing collapse in the Western Conference Finals, blowing their lead and letting the Warriors return to the Finals. This led to Durant to his breaking point. He was fed up with falling short of his goal, feeling as if the team around him couldn’t get him to the promised land. Durant decided it was time to test free agency and do what was best for him — despite the consequences this would have on the league. Durant said, explaining his reasoning to the public. Durant quickly adopted the “if you can’t beat ‘em, join ‘em” mentality, and after receiving an offer in the summer of 2016, he signed with the team that had previously stopped him just short of his goal — the Golden State Warriors. Durant joined an already star-studded team. Two-time MVP Steph Curry, all-star Klay Thompson and defensive playmaker Draymond Green were the cream of the crop on a roster full of very talented players. This squad led the Warriors to set an NBA record of most wins the in a regular season with 73 the previous season. This was a shock across the league and among fans. Never had a team acquired this much talent on one roster. Fans cried out in a fit of rage, and media personnel preceded to tear apart Durant’s image, calling him a snake. Former teammate Russell Westbrook posted on a picture on Instagram of an assortment of cupcakes shortly after Durant’s announcement, subtly dissing Durant by calling him soft for his decision. Durant forsaking his legacy has labeled him as patient zero for the “win now” plague that has been continually affecting the league. The year following Durant signing with the Warriors, teams across the league began to scramble to build super teams to compete with them. The Western Conference had many moves in 2017. Highlights include the Oklahoma City Thunder making blockbuster trades for Paul George and Carmelo Anthony to go along with league MVP Russell Westbrook. The Minnesota Timberwolves traded for Jimmy Butler to coincide with rising stars in Andrew Wiggins and Karl-Anthony Towns. The Houston Rockets traded for all-star Chris Paul to join future MVP James Harden and defensive playmaker Clint Capela. The East had fewer moves in 2017 but came with a bigger headline as Durant’s selfishness began to rub off onto other players. Former Cleveland Cavaliers star Kyrie Irving requested a trade from the team, citing that he wanted to be the star player on his team, instead of being in the shadow of teammate LeBron James.The Cavs agreed and sent him to the Boston Celtics, who had just signed star Gordon Hayward to complement surprise rookie sensation, Jayson Tatum. Even with all these moves, it was the Warriors who came on top yet again. Worst of all, most of the players that were traded came from teams where they were the star player. Their absence left their old team with significantly less talent and rendered them unable to compete with superteams, yielding them to the bottom of the standings or a low playoff spot just to be outmatched by a superior opponent. The drama around the league is even more heightened by internal disputes. Last season, former Defensive Player of the Year Kawhi Leonard sat out most of the season due to disagreements with his team. He was originally suffering from a hamstring injury which slowed his start to the season. Unfortunately, after his return, he only managed a few games before he was again unable to play. The problem was not entirely his hamstring, however, but also his lack of desire to continue playing for his team. Leonard was cleared by his team, the San Antonio Spurs, to play again, but he refused because he believed he still needed time to rehab. This led to conflicts within the locker room as teammates felt Leonard had given up on the team. After the season concluded, Leonard demanded that his team trade him. He specifically wanted to go the Los Angeles Lakers because he had heard rumors around the league that star players such as LeBron James and Paul George were looking to sign with L.A. come free agency. Leonard saw this as an opportunity to form a new super team since his former team had begun to fall out of power. However, Leonard’s dream team did not come to be as he was dealt to the Toronto Raptors in a trade deal this last offseason. Another event similar to Leonard’s situation erupted just before the start of the preseason. Jimmy Butler of the Minnesota Timberwolves demanded a trade from the team prior to their training camp. Butler told head coach Tom Thibodeau he does not plan on signing with the team long-term after the conclusion of the 2018-19 season. Butler gave a list of destinations he would prefer to be traded to. However, the team refused to meet Butler’s demand, and he remains with the team. Butler’s trade saga continues though as the Houston Rockets offer a king’s ransom of a trade to Minnesota. The Rockets offered a whopping four future first round picks to the Timberwolves in exchange for Butler. The Rockets look to add Butler to their already talented roster in their efforts to take the Warriors now. Clearly, the Rockets disregard the future of their franchise as they are giving up their ability to acquire young talent throughout the draft for quite some time. If this trade were to backfire, and their team was to fall apart, the Rockets would be in the gutters of the league for a long time. The Timberwolves, however, are waiting out on the offer. They want current players from the Rockets to go along with the draft picks. The franchise believes giving up Butler now without current pieces to replace him, will leave the team unable to win now. This is foolish of the T-Wolves as anyone within their right mind would jump at this trade. These debacles by Leonard and Butler prove that Durant’s selfishness has rubbed off on other players and teams around the league. Players are abandoning their teams and looking for the easy way out. They want to join or create star-studded teams, rather than build from within their own organization. Although teams around the league have put in the work to build rosters to compete with the Warriors over the last two years, it has all been in vain. This past offseason the Warriors added even more firepower to their cast. The team signed one of the biggest free agents on the market in Demarcus Cousins. Cousins will not play to start the season due to a season ending achilles injury sustained last season — but his return to the court is not far off. Once he does make an appearance, the Warriors will have the most devastating starting lineup the league has ever seen. All in all, the concept of buying out all the talent around the league and joining up with your competitors has made the NBA a joke of a league. It destroys the entertainment value of the game, leaving fans appalled and looking towards other sports venues to follow. Hopefully, the NBA league officials can find an antidote for this sickness that has swept across the league, cleansing the league of the “win now” plague.